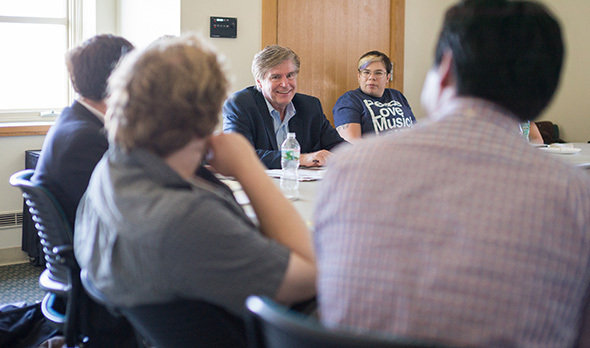 Dartmouth welcomed more than 100 researchers in American studies to campus for the 17th annual Futures of American Studies Institute in June. Participants included faculty members and advanced graduate students from universities and colleges in the U.S. and abroad, including Dartmouth graduate students in comparative literature and in the Master of Arts in Liberal Studies (MALS) program. The institute is directed by Donald Pease, Geisel Third Century Professor in the Humanities, and professor of English and of comparative literature. Pease launched the program in 1997, following the departure of the School for Criticism and Theory, which had been based at Dartmouth for 10 years, beginning in 1986. In addition to Pease and James Dobson, program administrator for the Futures Institute and lecturer in writing, Dartmouth faculty who participated as co-directors and plenary faculty included Colleen Boggs, director of the Leslie Center for the Humanities and professor of English and of women’s and gender studies; J. Martin Favor, associate professor of English; Michael Chaney, associate professor of English; and Ivy Schweitzer, professor of English and of women’s and gender studies. The plenary faculty also included Sandy Alexandre ’97, associate professor of literature at MIT. Dobson oversees the institute’s presence on social media. Over the past two years in particular, he says, previous years’ attendees who have not able to be present in Hanover for the conference have joined in remotely, extending and enriching conference discussions through social media. The 2015 Dartmouth Futures of American Studies Institute will be held in Hanover in mid-June, 2015.